"Grits and grillads at Atchafalaya are the quintessential New Orleans brunch dish and are done perfect here . The added touch of wild mushrooms bring it up to the next level. Paired with a rose cava is a must." "I crave these fries every Sunday. They have a standing pop up every Friday and Sunday from 4 p.m.-9 p.m. at Courtyard Brewery. It's amazingly different with its sour, tangy kimchi and spicy sauce, which is complemented by the cheese that pulls it all together." "The broth has lots of flavor. You can taste the star anise, clove and cinnamon, all balanced with a touch of sweetness. Always ask for a side of fermented chili paste to give it a kick." 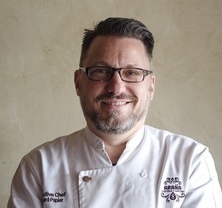 "Chef James Cullen takes a New Orleans approach to bbq shrimp and creates what I consider the best mussels in the city. It's best paired with a white wine on their list that dictates a road less traveled." "This is a great combo of sweet and savory for breakfast, on top of freshly baked sourdough bread. It's priced just right for a breakfast that promises not to be boring." "This is the best take on the classic Cuban. The pork belly really rocks it to the top, and the hand cut fries are crispy on the outside and light and airy on the inside. Perfect." When's the last time you had a flight? Tequila flights can get you right. "When's the last time you had a flight? Tequila flights can get you right. comw by and take a journey through the wonderful world of tequila." "Spicy watermelon Margarita. Bright, vibrant, and spicy! #noladrinks"
"Quesadilla time! Check out this shrimp quesadilla. Also available with chicken, pork, chorizo, or steak! #magazinest"
"Beautiful day for fajitas on the patio! #nolafood"
"Taco Tuesday! Fried shrimp, Baja fish, and Carné Asada.... that's our picks of the day. What about you? #tacos"
"Pork Loin Molé dinner special! $14 available all week. #diadelosmuertos"